Tin, an element known since antiquity, is a nontoxic metal that can appear either silvery and malleable or dull grey and brittle, depending on it’s crystalline form. Its chemical symbol Sn is derived from the latin stannum, which originally referred to a mixture of silver and lead, but came to refer to tin by the 4th century BCE. The english “tin” has germanic roots, but its origins are otherwise unknown. As a key component of the first intentionally produced alloy, bronze, tin played a key role in the development of human civilization. As tin ore deposits are distributed unevenly throughout the world, widespread use of the metal necessitated the development of trade networks connecting distant tin sources to tin-poor regions. Prior to the development of bronze-making techniques, copper had been used widely in decorative and functional applications, but its utility was limited by its softness. Pure tin, likewise, did not have ideal properties for metalworking. Adding tin to copper produces an alloy more workable than tin but harder than copper, that additionally is easier to melt and cast. This technological development enabled the production of stronger tools and weapons, and was therefore so revolutionary that we now regard its discovery in any given human society as ushering them into the “Bronze Age”. Though the “Bronze Age” was followed by the “Iron Age” and the eventual rise of steel and aluminum as the most commonly used metals, copper-tin alloys have retained a significant place in industry. They are valued for their resistance to corrosion, particularly in uses where they are exposed to salt water, as in ship propellers and submerged bearings. Unlike many other metals, bronze does not produce sparks when struck against a hard surface, and is used to produce tools for use in the presence of flammable gasses. Additionally, the alloy has notable acoustic properties and low metal-on-metal friction, lending it to use in musical instruments such as bells and cymbals and in springs and bearings respectively. Tin has also been used in other alloys such as pewter, and in soft solders either with lead or, more recently, silver and copper. It can also be used in almost pure form for punched tin art and as a low-toxicity and corrosion-resistant plating for steel, as seen in tin cans. Commercial tin is almost never entirely pure, as intentionally added trace impurities are necessary to prevent “tin-pest”, the conversion of metallic tin to brittle crystalline form at low temperatures. Molten tin is necessary for the process used in making most window glass, termed “float glass” as the extremely smooth, flat surface is produced by forming the glass on the surface of molten tin. Additionally, tin-nickel electrodes are used in some types of lithium ion batteries. The novel material stanene which, analogous to the carbon material graphene, is composed simply of tin atoms arranged in a single layer, exhibits the unique property of acting as a topological insulator, conducting electricity without energy loss like a superconductor, but only at the edges of the material. Materials that exhibit this property are of interest for use in next-generation integrated circuits enabling the production of smaller, faster, and more energy efficient computers. Several tin compounds also have important applications. Indium tin oxide is a conductor that can be applied by physical vapor deposition in a transparent film, and is used in liquid crystal displays, touch panels, organic light-emitting diodes, solar cells, and defrosting coatings for airplane windshields. Tin dioxide is a white powder used to opacify or impart white color to ceramic glazes, polish multiple types of hard surfaces, and as a protective coating on glass. Additionally, it may be used in detectors for carbon monoxide or other gasses. Organotin compounds are important in industrial chemistry, where they are especially noteworthy for acting as PVC stabilizers less toxic than the cadmium-based alternatives, and in laboratory organic synthesis. These compounds may also be used as biocides or preservatives. Finally, niobium tin is a superconducting compound that can withstand higher temperatures and greater magnetic field strengths than comparable materials, and therefore finds use in superconducting materials. Tin metal is produced mostly from its primary ore cassiterite. This tin oxide is reduced to tin metal in the presence of a carbon source, and subsequently purified as necessary for a given application. Increasingly, recycled scrap metal is also a notable source of tin. Tin compounds sprayed onto glass are used to produce electrically conductive coatings. These have been used for panel lighting and for frost-free windshields. Most window glass is now made by floating molten glass on molten tin (float glass) to produce a flat surface. Crystalline tin-niobium alloy is superconductive at very low temperatures. This promises to be important in the construction of superconductive magnets that generate enormous field strengths but use practically no power. Tin is the basis for many eutectic alloys. The discovery by early man that copper could be better formed and crafted if tin were added produced the first bronze and launched what we refer to as the "Bronze Age". An important tin compound is the chloride, which is used as a reducing agent and as a mordant in calico printing. Tin is also used in various metal alloys (See AE Alloys). Tin is available in many specific states, forms and shapes including pellets, rod, wire and granules for evaporation source material purposes. Tin oxides are available in forms including powders and dense pellets for such uses as optical coating and thin film applications. Oxides tend to be insoluble. Tin fluorides are another insoluble form for uses in which oxygen is undesirable such as metallurgy, chemical and physical vapor deposition and in some optical coatings. Tin is available in soluble forms including chlorides, nitrates and acetates. These compounds are also manufactured as solutions at specified stoichiometries. Tin is a Block P, Group 14, Period 5 element. The number of electrons in each of Tin's shells is 2, 8, 18, 18, 4 and its electronic configuration is [Kr] 4d10 5s2 5p2. The tin atom has a radius of 140.5.pm and its Van der Waals radius is 217.pm. In its elemental form, CAS 7440-31-5, tin has a silvery or gray appearance. Tin is commonly extracted from the mineral cassiterite, SnO2. The origin of the word tin comes from the Latin word Stannum which translates to the Anglo-Saxon word tin. Tin information, including technical data, safety data, high purity properties, research, applications and other useful facts are discussed below. Scientific facts such as the atomic structure, ionization energy, abundance on earth, conductivity and thermal properties are also included. Safety data for tin metal, nanoparticles and its compounds can vary widely depending on the form. Tin salts and organometallic compounds of tin are very toxic, but pure tin is not toxic. For potential hazard information, toxicity, and road, sea and air transportation limitations, such as DOT Hazard Class, DOT Number, EU Number, NFPA Health rating and RTECS Class, please see the specific tin material or compound referenced in the Products tab. The below information applies to elemental (metallic) Tin. Thirty-nine isotopes of tin are known. Ten of those are stable and have a wide variety of commercial applications. 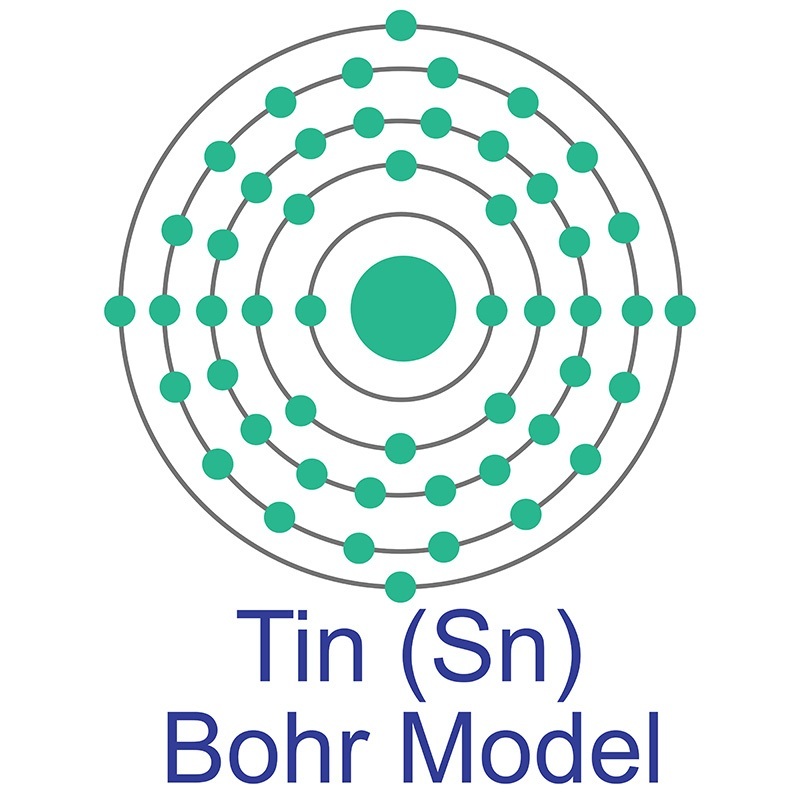 Tin has more stable isotopes than any other element.